The sandwich is probably the perfect meal. While you can stuff anything into it, typically it is piled high with meat, cheese, and vegetables between two pieces of bread. The best part is you can eat it without utensils and with only one hand. These recipes include virtually all types of sandwiches except the most popular of all, the hamburger. So whether you prefer chicken, fish, beef, or pork, these sandwiches are perfect for any occasion and hot off the grill. The real secret to the perfect cheese steak is a large cooking space. You just can't get enough room in a pan, so try heating up a large griddle on your grill. By putting bell peppers and onions directly over the fire for a minute or two, you can add a real grilled flavor to your cheese steak sandwich. These chicken breast sandwiches are topped off with grilled roasted bell peppers and a flavorful herb aioli dressing. This fast-and-easy filling meal is perfect for busy weeknight dinners. While this might sound like a lot of work for a sandwich, the marinated and slow-roasted rotisserie pork roast is so good, you just might want to eat it plain. Of course, topped off right, it's a fantastic sandwich known as a Cubano in Spanish. This is a delicious grilled chicken panini recipe that's fast and easy to make. You can add or substitute any of the ingredients to suit your needs. And if you don't have a panini press, a grill or regular skillet will work as long as you have a heavy weight to press on top of the sandwich. A clean brick wrapped in a couple of layers of aluminum foil will do the trick. Remember to use oven mitts to manipulate the hot weight or brick. 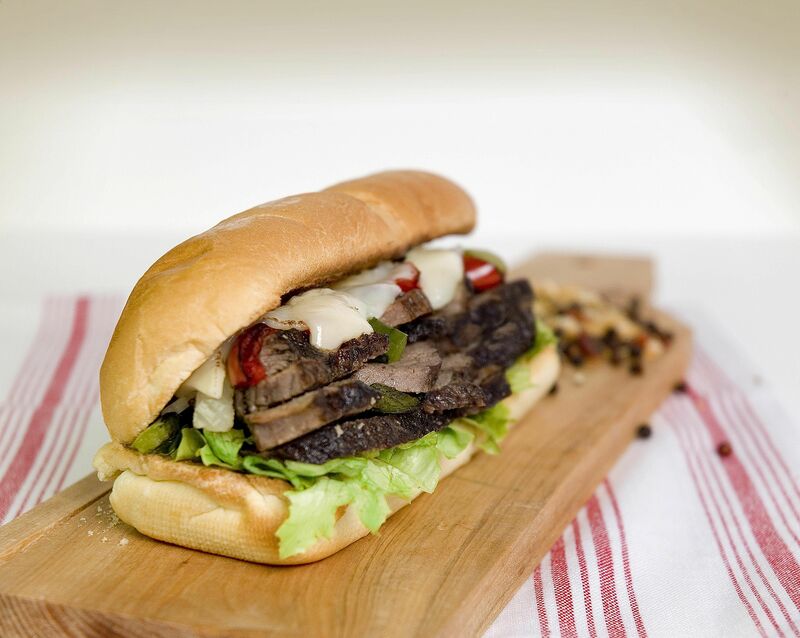 If you're in the mood for a good-sized steak sandwich, this Hoosier Rib Eye is the answer. Not only is it easy to prepare, but fabulous to eat. The secret is to not overcook the steaks. The meat will be much more tender and flavorful. The recipe starts with boneless, thin-cut rib-eye steaks that are cooked on a high-heat grill for 4 to 5 minutes per side. Remember to let the steaks rest for 5 minutes before eating so every bit of juiciness remains in the meat. A sandwich isn't always about the meat. Grilled vegetables, cheese, and mayo are the perfect filling between two pieces of sourdough bread that are grilled on a panini or on a grill under a weight like a foil-covered brick.